The TiVi700 Tissue Viability Imager combines polarization spectroscopy with image processing. The TiVi700 Tissue Viability Imaging system comprises a high performance digital camera equipped with polarization filters and user-friendly software for image processing and presentation of the skin microvascular blood concentration in terms of two-dimensional colour maps. This imaging system has the ability to “see beneath” the top layer of the skin and probe the dermal layer for information about the amount of red blood cells (RBCs) in the microvasculature. 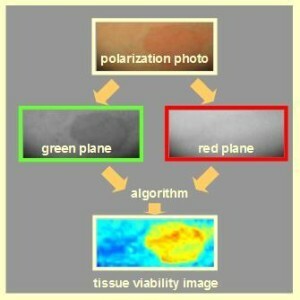 The operating principle of the TiVi700 Tissue Viability Imager is based on the fact that linearly polarized light in the visible wavelength region is partly reflected directly by the skin surface or the upper layer of the skin and partly diffusely scattered in the deeper located dermal tissue matrix. Most of the directly reflected light preserves its state of polarization, while the light being diffusely scattered in the tissue successively looses its linear state of polarization and becomes depolarized. A portion of the scattered light emerges through the skin surface as diffusely backscattered light. Consequently, the total amount of backscattered light consists of one linearly polarized portion being reflected directly from the skin surface or superficial structures and one portion with random polarization as a result of the multiple scattering processes in the tissue matrix. The depth at which the incident linearly polarized light has become almost completely randomly polarized is typically in the order of 300 micrometers, i.e. well into the reticular dermis in most skin sites. The RBCs in the microcirculatory network of the skin strongly absorb light in the green (approximately 500 – 600 nm) wavelength region, while light in the red (approximately 600 – 700 nm) wavelength region is comparatively less absorbed (red line). Since the light absorption of the static tissue components in dermis (yellow line) is smaller and less dependent on wavelength than the light absorption in RBCs, visible light spectroscopy can be used for the in-vivo evaluation of RBC content and the associated tissue viability. 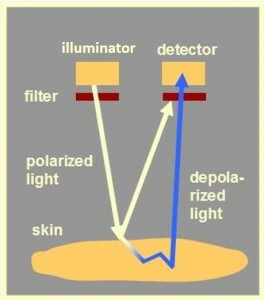 When the backscattered light of mixed polarization states reaches the camera, the photons backscattered from the surface are blocked by a second polarization filter positioned in front of the objective of the camera, provided this filter has a polarization direction perpendicular to that of the filter in front of the illuminator. This implies that essentially only light that has been interacting with the dermal tissue including its RBCs will reach the detector array in the camera. 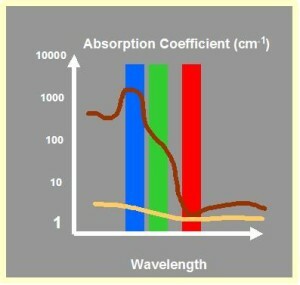 The TiVi700 technology takes advantage of the wavelength dependence in RBC absorption. By first separating the red, green and blue color matrixes and then applying an algorithm in which the value of each picture element in the green color matrix is subtracted from corresponding value of the red color matrix, an output matrix reflecting the local RBC concentration can be generated. Images can be processed in batch form by use of integreted Wizards. A multitude of image analysis routines forms an integral part of the TiVi700 system software. All data generated by the TiVi700 system can be exported to e.g. Excel® for further analysis of images and data.